Well, this ought to be an interesting match up. I hate fantasy, and I love Doom. What happens when you mash them together? 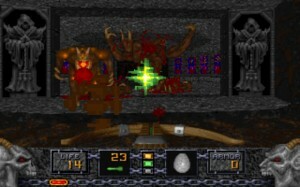 Heretic was Raven Software’s fourth game. It cemented a partnership with id Software that began back with Shadowcaster – Raven’s first-person RPG based on a heavily-modified Wolf3D engine. A similar situation happened here, with Raven licensing the Doom engine and likely benefiting from some Carmackian tinkering and feature tweaks after the engine code had to be locked for Doom’s development. The result is a game that falls squarely in line with Raven’s exclusively fantasy lineup thus far, obviously plays quite a bit like Doom, but features a number of improvements that fit Heretic’s slightly different thematic direction. The plot (as I understand it) involves three brothers called the Serpent Riders. These brothers maintain an iron grip over a distant land by using magic to enslave its kings and subjects. You play as the last member of an elven race naturally immune to this magic; subsequently branded as heretics by the possessed kings and hunted to extinction. Handy with spells and ripshit pissed, you decide to sharpen your pointy ears and charge through three episodes of ferocious fantasy fightin’ to assassinate one of the Serpent Riders while he’s away from his two brothers and vulnerable. Payback. Retribution. Et cetera. Heretic’s weapons ‘asplode beasties quite nicely. Anyone who’s played any 1990s FPS will need no introduction to the gameplay offered here. Fantasy elements merely give different artwork to the enemies, weapons, and level textures – the rest is a classic, gory blast-a-thon squarely in line with Doom and its other derivatives. You’ll hunt for keys, you’ll splatter quasi-demonic bad guys, and you’ll improve your arsenal as you go on. If this was your concern, then yes, everything you suspected is true. There are minor modifications to the formula, some interesting graphical tricks worth seeing if the history of that sort of thing interests you, and a campaign featuring staple FPS action that’s worth playing through if you’re a fan of the genre. But if you’re tired of this game already, well, you’ve become an FPS heretic. Nothing this game can offer will convince you to come back. Try as I might, direct comparisons to Doom are really unavoidable, so let’s get it out of the way. 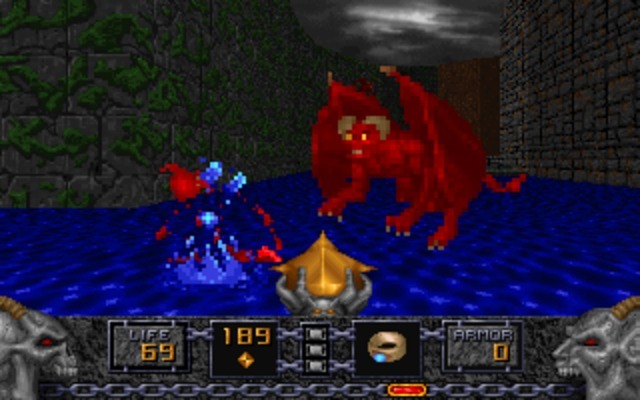 The game comes off a bit like what total conversions from the mod scene would later offer – blatantly reusing core elements of the original game to support new scenarios. Weapons behave exactly like Doom’s original set, and you can easily spot the pistol, rocket launcher, plasma rifle, and chainsaw code hiding under the new fantasy artwork. Monsters also fall into this camp, with knights hurling axes just as imps shot fireballs, gargoyles flying and charging just like Doom’s flying skulls, and a giant pseudo-boss character that floats around and spits fire much like the Cacodemon. Even level design is similar, with traps falling into the “crushing ceiling” and “monster closet” categories, and little in the way of puzzles beyond looking for optional secret areas or figuring out which door an unmarked switch tripped. Still, Heretic manages to stand on its own. If you’re an FPS die-hard that won’t mind playing another Doom-like campaign, then Heretic won’t disappoint. It will even manage some surprises. Level design delivers, trending toward large outdoor areas or ornate cathedrals with colorful stained glass. 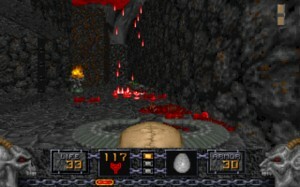 Typical dungeon or catacomb levels, while certainly present, are comparatively rare. This helps to make the game feel different from the many dungeon crawlers before it, and if you’re used to something like Ultima Underworld, the levels will seem incredibly colorful, detailed, and diverse by comparison. The environment also plays more of a role in gameplay itself. Rivers and waterfalls appear, with currents that actually drag the player along. Ice floors screw up your movement and slide you around based on momentum. Lava flows through other levels, with platforms that sink under the player’s weight. Impressive stuff, and before Dark Forces made this famous. There’s also some great graphical effects that are new to the engine. First is a limited system of “gibs.” Rather than simply falling into static corpse puddles, some enemies (most noticeably the gargoyles) will also eject smaller pieces upon impact with the ground. It’s not the flying viscera of Rise of the Triad or Duke3D, but you’ll definitely notice that pieces get scattered around the ground a bit. Likewise, the environmental effects interact well with corpses. Shooting a gargoyle down over water results in a splash sprite and accompanying sound. Shooting one over lava causes smoke to hiss where it lands. Lighting also seems slightly improved, with good use of light sectors for shadows, and flickering for candlelight. Heretic’s major addition to the genre is its inventory system. Instead of using every item as soon as you run over it, most objects are collected and held in an inventory you navigate with the bracket keys. The ability to hoard items and deploy them only when needed is very helpful and very appreciated. You could argue that it makes the game easier, but I’d say it’s really no different than leaving items behind to pickup later. A flask acts as a portable health kit, and can help you survive any ambushes. The invisibility, invincibility, and torch light artifacts work the same way, and because they were just a key press away, I found myself using those powerups far more than I did in Doom. They’re also not just rehashes of Doom’s toys – a pair of wings gives you limited ability to fly, an hourglass timebomb demolishes crowds, and an egg shoots magic that will turn the deadliest of foes into a harmless chicken. The Tome of Power is probably the most refreshing part of Heretic. Most interesting is the Tome of Power. When activated, it actually changes the way your weapons work (somewhat like a secondary fire). 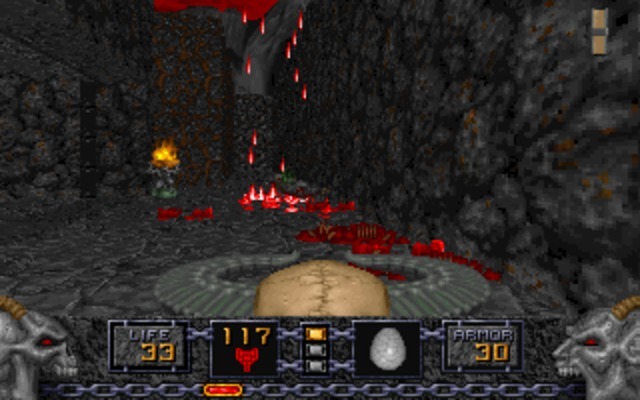 The Hellstaff shoots out fireballs exactly like Doom’s plasma rifle, but with the Tome of Power active, it causes fire to rain from the sky in an area of effect attack. Your regular wand is fairly wimpy. With the Tome, it shoots multiple bolts at a time with increased damage to bosses (making great use of otherwise stockpiled ammo). Tomes are limited pickups just like other inventory items, so you can’t use them recklessly, but there’s quite a lot of satisfaction to be had when you can break one out at the perfect moment. It’s a great idea that I wish more games had considered. Overall, Heretic is pretty much what you’d expect from a “Doom-clone.” It’s an industry-standard length at three full episodes, and any fantasy elements take a backseat to the core gameplay of messily blasting apart otherworldly foes. It’s about on par with id’s creations, has some creative differences and additions, and is worth playing through if you’re a fan of the genre or, for whatever reason, aren’t playing Doom. That strength is an equal weakness for everyone who isn’t out to play every 90’s FPS ever made, and without Doom’s novelty, the number of people interested in playing an almost identical game is understandably cut. Copies the best parts of Doom and adds some brilliance of its own. Strong entry to the FPS genre. Copies Doom a little too closely. Has its own twists, but hardly a unique experience. Hey! Love the reviews, just wanted to let you know the follow up to this (Hexen) is really good and has one of the best FPS weapons in all of the shooters I’ve played. This was the “Wraithverge”. When playing the Cleric character it would call souls that would run screaming from your staff and encircle and kill enemies…Great Stuff! Great review, but “Copies Doom a little too closely” in my opinion is more “the good” thing. Doom and Hexen lovers should check new old-school FPS Project Warlock. I’ve loved this game.